One of the reasons I love blogging is that I learn so many things from my readers. And the questions I receive always challenge me to create better and easier recipes. 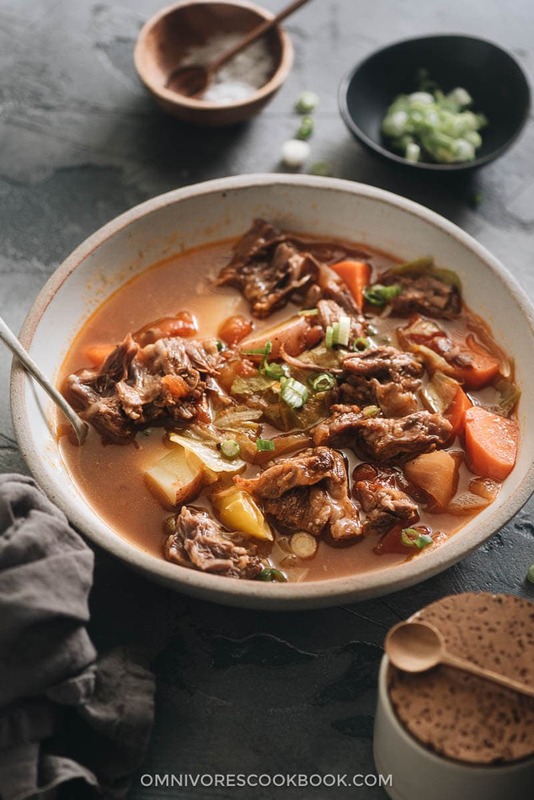 A while ago I received a request to develop an easier oxtail soup recipe. 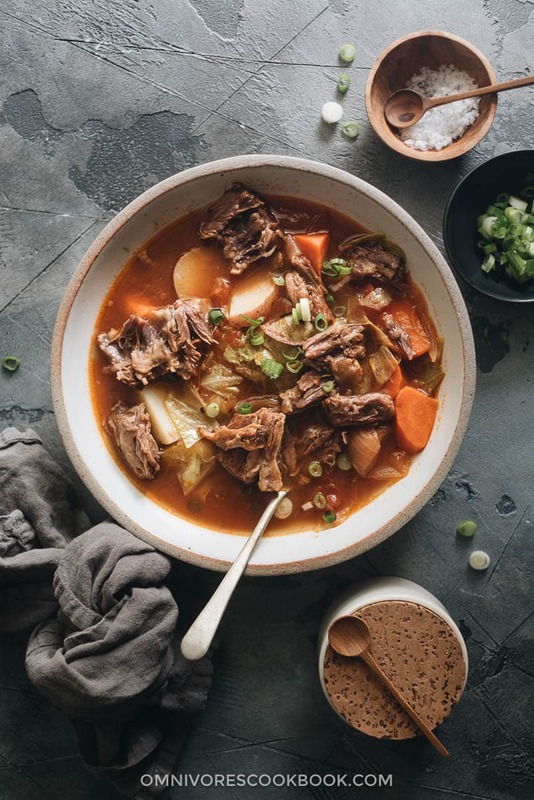 I had published my mom’s oxtail soup recipe a long time ago. I read the recipe again when I received the request. Oh my, the cooking process for that dish does look super complicated in retrospect. It doesn’t require you to brown or par-boil the oxtails before braising. It doesn’t require you to transfer the soup to another pot. You don’t need to monitor the cooking. Simply set it and forget it. I’m sure you’re wondering about the results. I guarantee it tastes just as great as the original version. 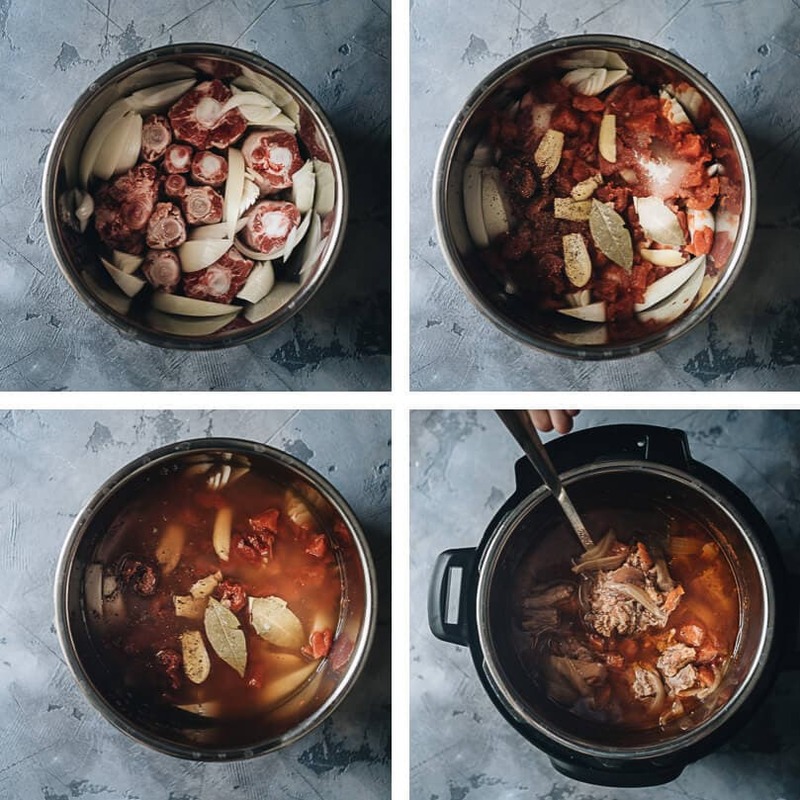 When I make braised meat or stew on the stovetop, I usually brown the meat to seal in the juices and make the meat taste richer. This is not the case when using the pressure cooker. The pressure cooker raises the boiling point of the water in the pot. The extra-high heat not only speeds up the cooking process, but also promotes caramelization and browning in a different way. Yes! Your beef will be caramelized in the liquid and it will result in a deep and complex flavor without browning the meat. You can use the natural release method for this recipe. But if you’re in a hurry, you can use the semi-quick release method. Simply wait for 10 minutes to let the pressure to release naturally for a bit, then switch to quick release. I always add the veggies after cooking the meat to get the perfect texture. 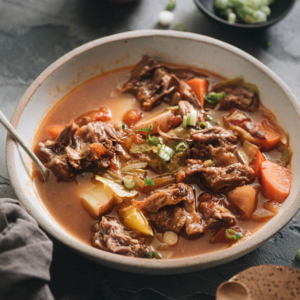 Since oxtails take a long time to cook, the veggies will melt into the soup if you add them at the beginning. That’s it! This recipe is really simple and hassle-free. I wouldn’t mind cooking it on a busy weekday evening. The oxtails will come out buttery-tender and rich and the soup very hearty. Serve it with a bowl of steamed rice or some toasted bread and dinner will be ready in no time. 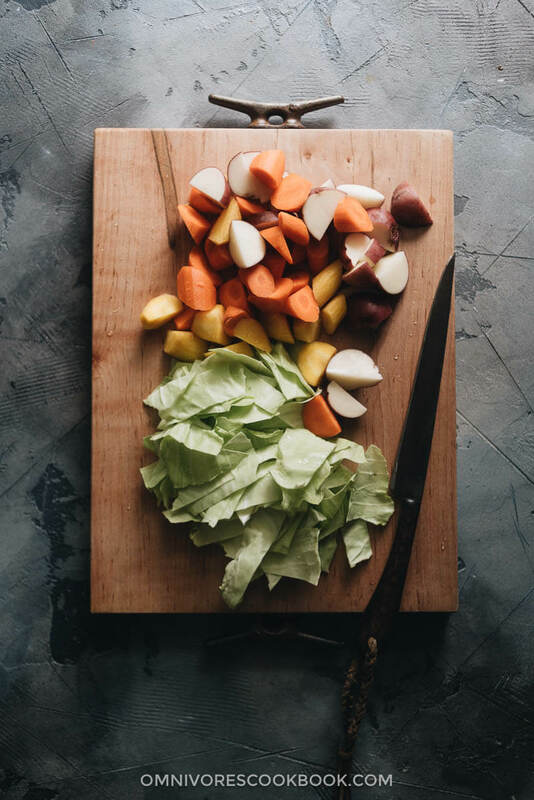 Add all the ingredients to the pressure cooker (or Instant Pot) except the potato, carrot, and cabbage. Try to arrange the oxtails in a single layer so they cook evenly. If you’re concerned about scorching, especially if you’re using a stovetop pressure cooker, layer the onions on the bottom before adding the oxtails. Seal the lid and be sure to close the valve. If you’re using a pressure cooker, heat over medium heat until pressure is added. Then turn to medium-low heat and cook for 45 minutes. If you’re using an Instant Pot, select high pressure and set the timer to 45 minutes. Use a ladle to skim and discard the oil floating on top. If you plan to store the soup for later, I highly recommend you fridge (or freeze) the soup at this point. It’s so much easier to skim the oil completely once the soup is chilled because the oil will clot into a white layer, separate from the soup. You can boil the veggies when you reheat the soup in a pot, so the veggies will be freshly cooked. (Optional) Remove the oxtails from the soup and place them onto a big plate. Use a pair of tongs and a fork to remove the meat from the bones. I usually do this step if I’m serving guests but skip it if I’m cooking for myself. Add the potato and carrot to the pot. For the pressure cooker, turn to medium heat. For the Instant Pot, turn on the Saute function. Let boil for 10 minutes. Add the cabbage and cook for another 5 minutes, or until all the vegetables turn tender. Turn off heat. (Optional) Return the oxtail meat to the pot if you removed it from the bones previously. Serve the soup hot with steamed rice or bread as a main dish. I used vegetable stock this time because I ran out of beef stock. The soup turned out surprisingly refreshing and well balanced. I highly recommend using vegetable stock if you want a lighter soup. And of course, always use beef stock if you prefer a richer taste. For a stovetop pressure cooker, carefully move the pressure cooker to your sink. Use a wet towel to cover the side of the lid and avoid covering the vent and valve. Run cold water over the towel to release pressure. For the Instant Pot, carefully use a spatula (or anything with a handle) to switch the valve to the other side to release the steam. Make sure to stay away from the valve when you do this, so the hot steam won’t burn your skin. 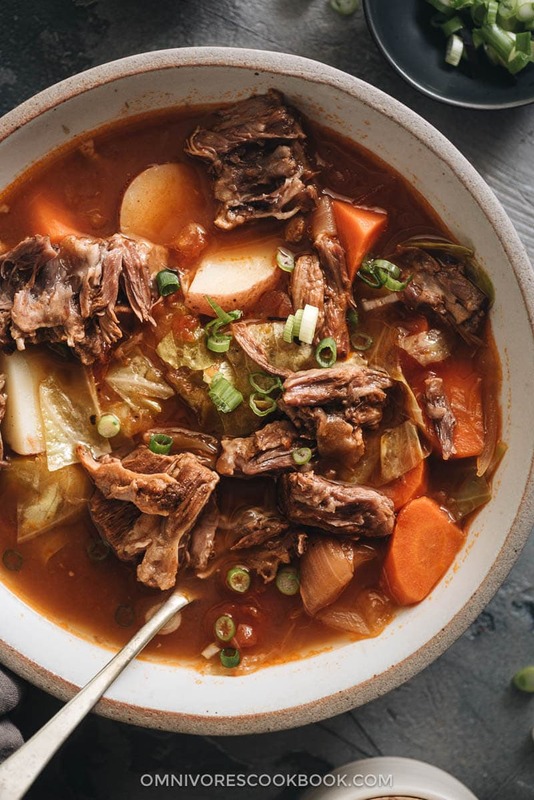 Can you tell us how this recipe will change for those of us using a crock pot? Hi Joanne, I’ve never tried to make this dish in a crock pot, but I’m pretty sure that you can use the exact ingredients. The cooking time should be around 9 to 11 hours on low setting. You need to add the potato and cabbage half way through, otherwise they will fall apart at the end. I would also cut the potatoes to bigger chunks, and cut the cabbage into wedges (instead of chop them to pieces) so they won’t cook too fast.